I’ve merged my enthusiasm for knives and backpacking to bring you a list of backpacking blades that each weigh less than two ounces and are capable enough to handle trail life. Since every person is different, I put several options together so that you can find one that fits your needs and mode of carry (how and where you carry it on your person). These options are in no particular order since one knife won’t be the knife for everyone. 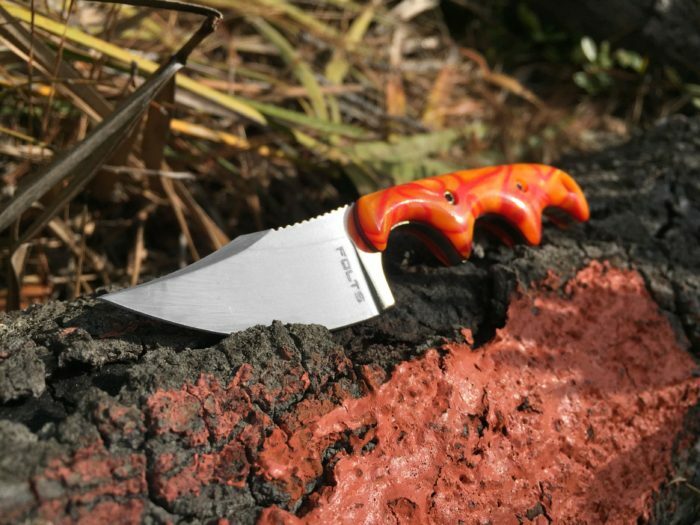 Mini Review: The Classic SD is one of the most popular knives on the trail for good reason. It’s technically a multi-tool and is of the lightest options available. The seven functions include: blade, scissors, nail file, screwdriver (2.5 mm), key ring, toothpick, and tweezers. Drawbacks include a small blade and the small fit in the hand (ergonomics) making it harder to hold than some other options, especially since the handle is slick and offers no texturing to improve grip. This would be compounded when exhausted and fine motor skills are more difficult, as well as in the rain, snow, or high humidity. Still, it has better ergonomics than a razor blade and multiple functions, making it a safer, capable ultralight option. 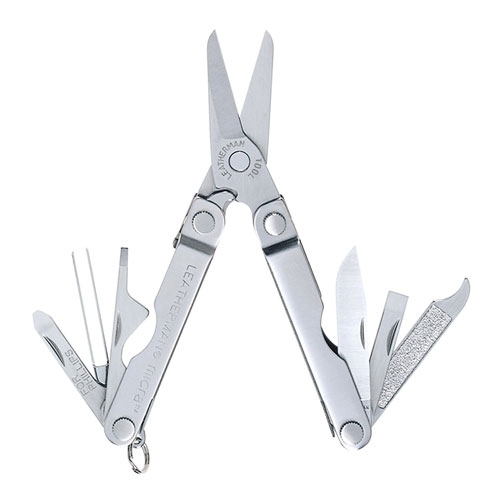 Mini Review: Some people will want the maximum amount of tools for the least weight, and the Leatherman Micra strikes that balance. It has the most robust pair of scissors you’ll get for the weight. 11 functions of this tool include: blade, scissors, flat/phillips screwdriver, ruler, nail cleaner, tweezers, bottle opener, nail file, medium screwdriver, extra-small screwdriver, and key ring. With a hardy construction and stainless steel, this should be low maintenance and will last on long hikes. One draw back is that this has more capacity to trap dirt among the tools, but it should be easy to clean it out. The blade on the Micra is almost the same length as the Classic SD, but if you planned to carry a separate bottle opener or want a more robust, easy-to-handle pair of scissors, this might be your best bet. Besides, none of these other knives will have a ruler! Is having the extra tools worth the extra .8 ounces over the Classic SD? That’s for you to answer. Mini Review: Vargo has made a very lightweight fixed-blade knife by using a titanium alloy instead of stainless steel. The titanium alloy allows the metal to be precipitation hardened, so a normally soft metal can now be effectively used as a knife blade. The result is a large blade at a very low weight. Vargo also includes a lightweight sheath for the fixed blade, plus included a clip in the handle. This makes it easy to access and pack almost anywhere. One drawback is that any “hard” use may dull this blade faster than others, since its properties are still softer than other metals. 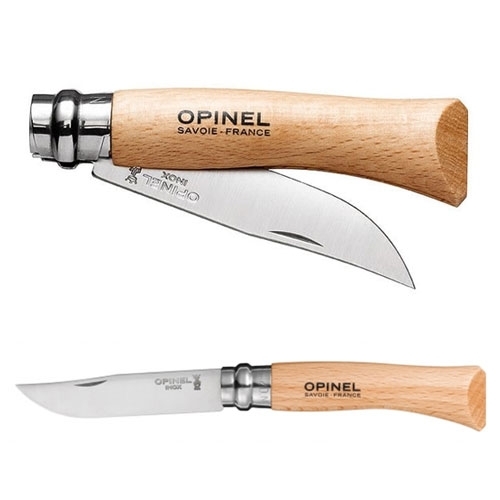 Additionally, the handle is thin and without handle scales (keeping the weight down) making the knife bite into your hand during use, which may be uncomfortable and less ergonomic than other options. With a great blade shape for trail life and a stunningly low weight, you might enjoy this knife if you want a large blade at minimum weight. Mini Review: This time tested, vintage knife is still a workhorse despite its light weight. The beechwood handle is light in hand and very ergonomic, though it doesn’t feature any texturing to help with grip. The locking mechanism in the metal collar between the blade and handle is simple to use, though not as easy when wet. It’s very unique, so make sure you know how it operates before heading out on trail. Like any other lock on a folding knife, you may cut yourself if you fail to engage it properly. If you like vintage, time-proven classics that don’t break the bank (or scale), this might be your new knife. Note: There is a (X90) carbon steel version available as well. Mini Review: For the money, this is one of the best knives on the market. The unique handle shape makes this knife one of the easiest to handle with or without gloves, regardless of wet conditions. This extremely ergonomic knife also offers multiple blade shapes (Bowie pictured) including wharncliffe, tanto, and drop point to give you style/use options. The lanyard helps with retrieval and grip. There is some texturing—known as jimping—on the spine, above the handle where your thumb rests. This helps control the knife and keeps your thumb from slipping during use. The knife sheath comes with options for neck carry, belt carry and pocket/pack carry, making it easy to stow wherever works best for you. The main drawback is that you should try to keep moisture from sitting on the blade as this steel will be more prone to rust than some other stainless steel varieties. Wiping the blade free of moisture or food before returning the knife to the sheath will help inhibit rust. This affordable, widely used, and easy-to-handle knife is great for weak hands, or those who want the most control of their blade. Mini Review: The Spyderco Dragonfly 2 fills a niche between the other blades on this list. It’s bigger than the Classic SD, smaller than the other folding knives, more ergonomic than the other small knives, and light enough to carry daily on or off the trail. It’s very balanced. 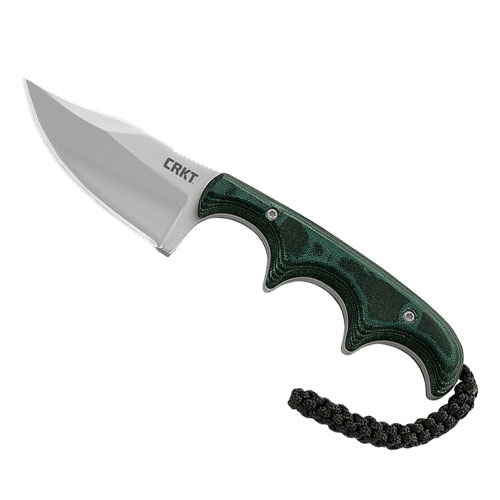 Like the CRKT Minimalist, you will see jimping to help control the knife but notice it also has jimping on an extra finger groove that extends onto the blade just before the sharpened edge. The handle scales also offer aggressive, multi-directional texturing which offer excellent traction for your hand regardless of gloves or wet conditions. Together, the texturing and finger groove make this small knife much easier to hold and handle than most knives this compact. Want a small, dedicated blade that will handle well in all conditions? Pick up the Dragonfly 2. 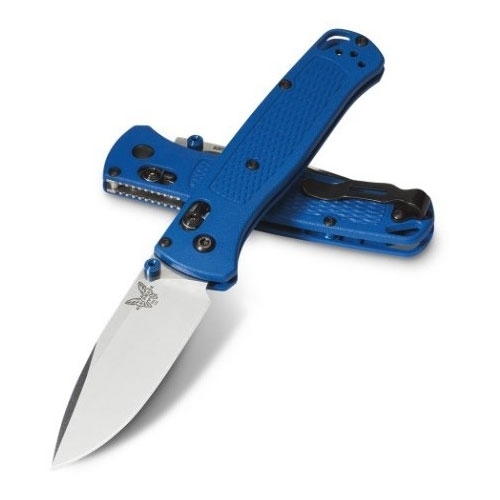 Mini Review: This Benchmade knife is a HUGE folding knife for the weight. It’s ergonomics are similar to the Dragonfly 2 with the spine jimping and textured handle, but the large, polymer handle on this would be more comfortable for large hands. It will also carry deep in any pocket with its low-profile pocket clip. The AXIS® lock offers an added level of confidence with ambidextrous features that lefties will enjoy. It’s worth mentioning that while the s30v stainless steel is part of the higher price tag, it offers some of the best edge (sharpness) retention and will take the abuse on trail. This knife is packed with features, large, and safe to handle, making it an attractive option for any hiker. Mini Review: The ARK “Always Ready Knife”is another ultralight fixed blade, but this one is sporting a secret: It’s impervious to rust. Go ahead and bathe it in salt water, or whatever your heart desires, the H1 steel can take it. The tradeoff is that H1 steel is a little softer than some other steels, so you may have to sharpen it sooner than others. 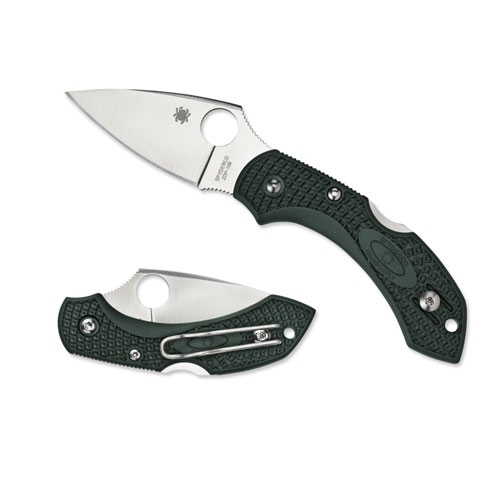 Spyderco once again offers excellent grip with their multi-directional texturing on the handle. If you’ll be in a wet, humid environment or you’re thinking of pack-rafting along your hike(s), this would be an “always ready” option that weighs less than one ounce! If all of these sound great or you feel like you need more info to make a choice, check out my companion article “How to Pick the Perfect Backpacking Knife” to learn about knives, blade steel and how to choose a knife that’s right for you. Also, I wanted to mention that I didn’t list a razor-blade as an option because it’s this users opinion that they do not offer sufficient surface area to get a safe grip and still be able to handle the knife needs that come up out on the trail. I don’t think they are safe (enough) for that reason, especially given the weight of the knives on this list. Good luck and have fun with this important tool out on the trail! Let me know what you end up carrying on the trail in the comments! Just in case you wondering what a knife nerd like me carries on the trail, my answer might surprise you. I carry TWO knives. *gasp* I know… fitting, right? I’ve done my homework, though, so both blades still weigh less than 2oz combined. I carry the Victorinox Classic SD and a custom version of the Minimalist by knife maker Alan Folts. This custom Folts Minimalist is a Beta-Titanium version of the one listed in this review with Kirinite handle scales. Since I frequent the Florida Trail in my home state, the titanium alloy is perfect to prevent corrosion and the handles are blaze orange like the Florida Trail. If you like these options, but want to spend a little more money on something custom, there is a plethora of additional options out there in the custom knife world. Let me know what you’re carrying in the comments! Great article Josh! And I must say it’s Alan Folts for the win every time! Thanks J.R.! Ya, he produced a Beta-Titanium Minimalist for me that weighs in at the same weight the Vargo Wharn-clip does, but with better ergonomics and more style! – Alan Folts, you are a wizard. I carry two blades when I’m on the trail: the Leatherman PS4 multitool in my repair kit (baggie with multitool, piece of tenacious tape, micro tube of super glue, dental floss and needle, small amount duct tape). I prefer the 2.1-oz PS4 to the 1.8-Oz Micra because it has pliers rather than scissors. When you need pliers, you need pliers. With this kit, I’ve repaired all manner of woes on the trail. Clipped to my pocket, I carry my EDC blade, the 3-oz Kershaw Leek in stainless. The 3.5″ blade is long enough to be useful. My wife prefers her SpyderCo Ladybug at 0.6 ounces. Folts knives are awesome but I prefer folders on the trail. And FWIW, when thru hiking, I carry .75-oz Victorinox flat-folding nail clippers in my toiletries. They work great for clipping cord or dental floss and work well for dealing with blisters and keeping toe nails (if any!) in check. That’s awesome, Ed! The PS4 was VERY close to being on my list. I ended up giving the edge to the Micra only because i felt like most hikers would prefer scissors. I carry the PS4 on me everyday (at this moment, in fact). It’s a great choice! And the Leek is an awesome blade so it’s hard to fault you for carrying that 3oz! Thanks for the review. Makes me happier with my 1.4 oz knife I use for cutting cheese and sausage. I’ve been thinking of how to go lighter and this eased my mind (the one ounce knife I picked up just doesn’t seem like it will last). You’re welcome! Glad you enjoyed it and gained some peace of mind. Great article. 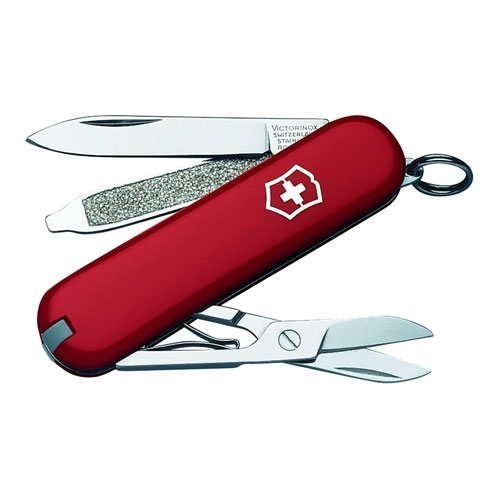 I carry the Victorinox Classic SD as a multitool and the Deejo 15g for its sharper, longer blade. Also its design is really cool! Andrew, I had never heard of the Deejo 15g – thanks for turning me onto it! Great weight and interesting design (lists itself as a liner lock, but since it’s part of the single “scale” it’s very unique). Wish it was in a steel grade a little better than 420 stainless, but… the price is right! Excellent choice! in my experience the Deejo15g is a pretty bad knife. when i got mine the tip of the blade was overheated and the temper ruined. so not only is it a bad steel, but the heat treat on it is pretty bad too. also i feel like it is pretty unsave. on mine the screw holding everything together loosened relatively quickly wich made it possible to touch the edge when the blade is closed and that also made it not look up in open position. so i really wouldn’t want to rely on it out on the hike. it was pretty disappointing, because otherwise i really liked the design of the knife. it looks pretty interesting compared to most other knives. Thanks for making us aware of possible production issues on this knife. I agree about the bad steel; a bad heat treat would make it even less desirable. For me it’s the Opinel no. 7 stainless. Currently I only have the no. 8 carbon steel. Excellent, functional and lightweight little knife. 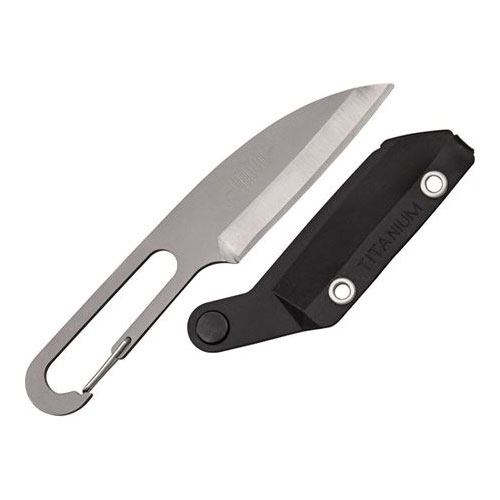 Carry a knife, but I’m a minimalist … a small, folding blade that’s pretty dang light. I envy the world-class tweezers, though, that are hidden in the Victorinox knives. Those tweezers can come in handy, every now and then. That Spyderco Dragonfly 2 interests me. I keep my knife in my pocket, though, not riding on my hip, so the belt clip would be a pain. Do you know if it can it be removed? Looks like it might bolt on. Yes, the clip is removable and I carry the Dragonfly 2 clipped on my pocket almost every day i’m not on the trail. It’s a great clip if you decide to use it. On a recent 2 day backpacking trip in Yosemite, my Dad and I made do just fine with my $40 Buck 55 and $20 Kabar Dozier lockback folding knives. Both are lightweight, sharp and it wouldn’t have been a huge deal if either would’ve been lost on the trip. Hard to beat the Dozier for price, weight, usable blade length and color options but the Buck 55 has the classic look, is even more compact yet solid, and is USA made if that matter to you. Nice, Steven! There’s nothing wrong with a classic Buck 55. For the money, I prefer other options but it’s under 2oz and is a stainless steel. I like a lanyard hole or clip and a better steel for the price (something better than 420 stainless), personally, but like you said: It will do the job. 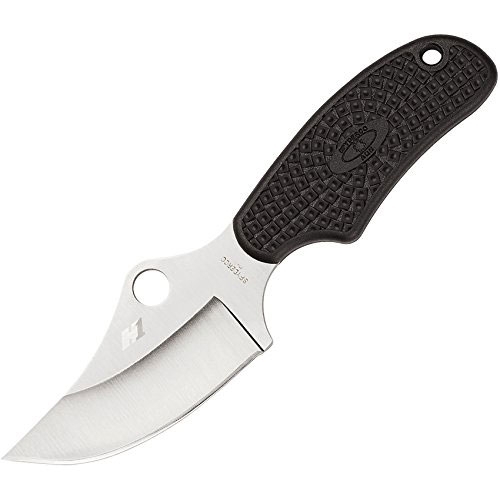 The Kabar Dozier is a good example: it’s less expensive, Aus 8 steel is an upgrade and it has a lanyard hole and clip for retention options out in the woods. It even has a larger blade. The only trade off is that it’s slightly heavier at 2.4 ounces (still pretty good). Thanks for sharing your knife choices – I’m sure these are versatile and no doubt they will do the job on a 2 day trip to Yosemite. My lady picked me up a Bugout for Xmas, and I’m loving the weight and how it pockets. I’m thinking whenever I hit the trail..that’ll be my go-to. Bugout’s got plenty of belly on the blade, and sharp enough to shave with. You can’t really go wrong..As long as you don’t mind dropping a little extra cash. Plus,it’s blue! Easy to spot if you drop it in the leaves.. I am getting a Cold Steel 20AZ Bird and Game. I like that its basically full length with a decent blade, but still lightweight. I’m not a fan of folding knives as i have had a few fold up on my hand before. That has an excellent blade length for the weight and although I’m not personally excited by Aus8 steel, I think it’s capable – especially for the price. Good choice and thanks for sharing! Once you get that on hand, I would love to know what the weight is including the sheath; I can only find the weight for the knife sans sheath.